The cockpit voice recorder was damaged but the memory module was intact. A pro-Russian rebel touches the MH17 wreckage at the crash site of Malaysia Airlines Flight 17, near the village of Hrabove, eastern Ukraine. DUTCH LEAD INVESTIGATORS into the shooting down over Ukraine of flight MH17 have said that data from the cockpit voice recorder was intact and had not been tampered with. “The cockpit voice recorder was damaged but the memory module was intact. Furthermore no evidence or indications of manipulation of the cockpit voice recorder was found,” the Dutch Safety Board (OVV) said as the black boxes were being analysed in Britain. The recorders, salvaged from the plane wreckage in eastern Ukraine, have been handed to the Air Accidents Investigation Branch headquarters in Farnborough, southwest of London. AAIB experts are tasked with extracting information from the cockpit voice recorder, which should give them hours of pilots’ conversations, as well as the contents of the flight data recorder. “The cockpit voice recorder data was successfully downloaded and contained valid data from the flight. The downloaded data have to be further analysed and investigated,” the OVV said. The boxes — which are actually orange in colour — were delivered to Farnborough by the OVV, which is leading an international investigation into the crash in which 298 people died, 193 of them Dutch. The OVV is coordinating investigation teams from eight different countries, including Russia. Pro-Russian rebels controlling the crash site handed the boxes over to Malaysian officials on Tuesday, following an international outcry over the treatment of the wreckage and the bodies of the victims. Western governments say the evidence points to the Boeing 777 plane having been shot down with a missile by pro-Russian separatists. Email “Valid data downloaded from flight MH17 black box ”. 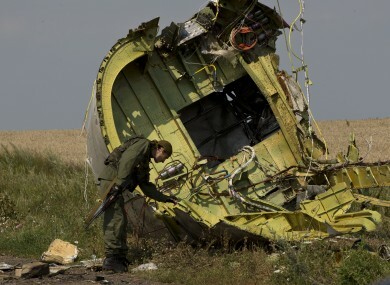 Feedback on “Valid data downloaded from flight MH17 black box ”.